We have several smaller customers that use a VMware ESXi host with just a single Windows Server VM. To backup these VMs we often use either Windows Backup or a third party application running within the guest that saves all important data to an external USB drive. To be prepared for things like water damage we always suggest to use two rotating disks with one stored securely at another location. The problem here is that many of our customers are not very tech savvy and they generally don’t want to change anything on the server. That means I had to find a way so that they just have to replace the physical USB backup drive and don’t have to think about how the USB drive is forwarded to the VM. To solve this I use the PCI pass-through option on the ESXi server. The screenshot on the right shows how that looks on an ESXi 5.0. 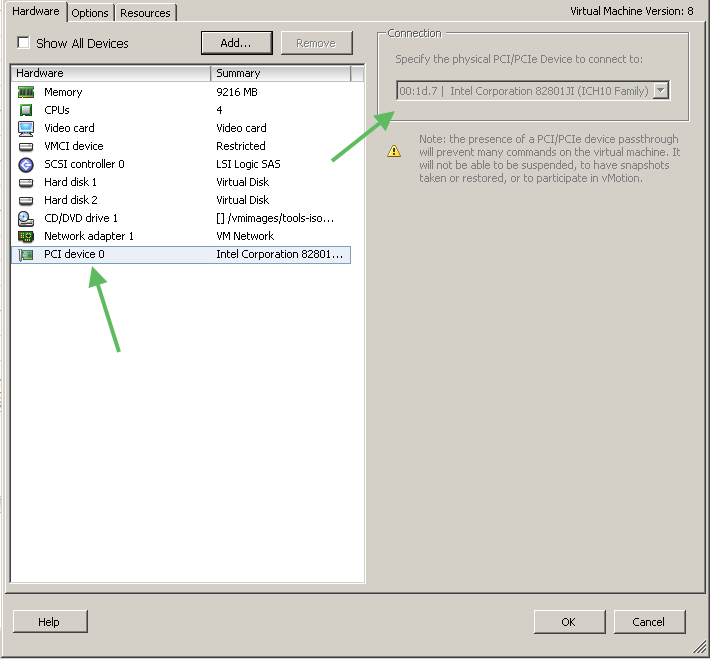 After shutting down the VM add a new PCI device and select the USB controller of the host system. After switching the VM back on you can connect any device to any USB interface on the host and everything is forwarded automatically. However be aware that only a single VM can access the USB ports because you can forward a PCI device only once. Another solution regarding USB devices is discussed in the VMware KB entry “USB support in ESXi/ESX 4.1 and ESXi 5.x“.